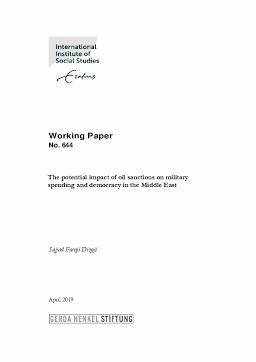 This study examines how negative oil shocks (due to the oil boycotts) could affect the military expenditure and the quality of democracy in the oil rentier states of Middle East by applying the annual date from 1990 to 2017. I use both economic and political variables in a panel vector autoregressive (PVAR) model of oil boycotts. The estimated PVAR models show significant impacts of oil boycotts both on key economic factors (government revenues, defence and non-defence expenditures) and on the different indicators of the political system. Using panel impulse response functions (PIRFs) and a panel variance decomposition analysis (PVDC) based on the estimated PVAR model, the findings indicate that the responses of political institutions and different indexes of democracy such as electoral, liberal, participatory, deliberative, and egalitarian democracy to decreases in oil rents are positive and statistically significant, whereas the response of military spending is negative and significant. Moreover according to the results of the variance decomposition analysis the variations in oil rents and political situation explain considerable parts of the variation of defence expenditures in the Middle Eastern countries implying that defence expenditures are considerably influenced by oil rents fluctuations and the quality of political system in the Middle East. These results are not sensitive to different proxies for oil abundance (such as fuel exports and amount of oil production) and different indicators of political institutions (V-DEM democracy indexes and polity2), as well as different orderings of variables in the panel VAR system.